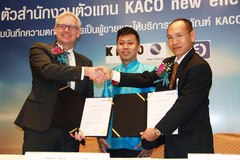 KACO new energy and Fah Chai Engineering Co. Ltd have worked together to establish Thailand as the base to expand their PV business, with Fah Chai Engineering being the official representative for KACO new energy's products and services in the APAC region. In a signing ceremony on 15th May, KACO new energy's Head of Business Development, Mr. Dorko Eliaszewskyj appointed Fah Chai Engineering Limited as the official vendor for KACO new energy's products and services. Responsibilities as Country Manager of KACO new energy Thailand will be taken by Mr. Phiphat Phakhananyoothin. In close co-operation with KACO new energy Asia (formerly known as KACO new energy South Korea) he and his team will be serving customers operating in Thailand and the neighbouring countries. 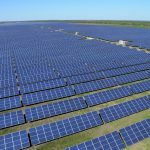 "One of the main reasons we chose Thailand to establish this partnership is its suitable geography and the increasing demands for solar energy in the Asian regions. KACO new energy looks forward to making the country a central hub for distributing its technology to the ASEAN Economic Community and the Southeast Asia Regions", stated Dorko Eliaszewskyj. The company will target all markets beginning with self-consumption customers like condominiums, factories and warehouses or hospitals and cargos. Up the scale are customers who produce electricity in a Power Purchase Agreement or operate as Engineering Procurement and Construction companies (EPC). Also on the list are solutions for remote areas with little or no electricity, such as country borders, in the forests, the mountains or on islands. As Dr. Akaranun Mongkolchonsawat, Chief Operations Officer of Fah Chai Engineering, pointed out, the company is well prepared in terms of manpower for future business: eighty percent of the staff are engineers and have undergone a standardised training program at the KACO Academy in the German headquarters. Thus, every step from design to monitoring and maintenance will be executed with a great deal of expertise. And, of course, spare parts are in stock to support all clients at global factory standard. For the year 2015/16 KACO new energy and Fah Chai Engineering are expecting sales of up to 1,300 MW.